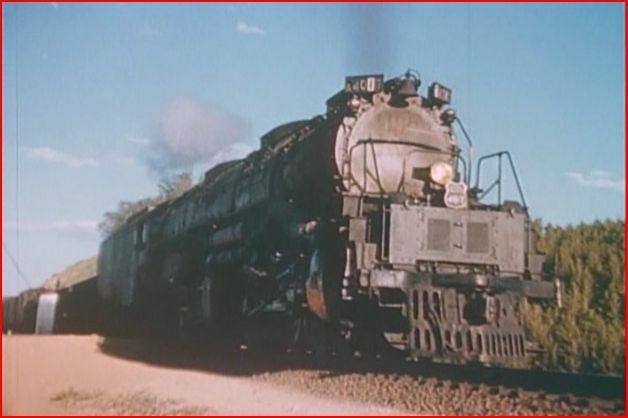 The Golden Twilight of Postwar Steam, Steam in the 50’s Special: 7 pak . This review is from the 7 pak set. Each show reviewed individually. A review of the complete package, will appear upon completion of the shows. 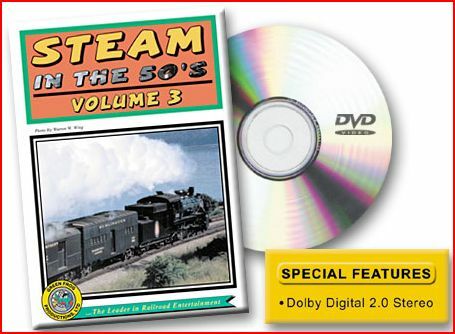 Steam in the 50’s Volume 3 is the final show in this series. As part of the Steam Special 7 pak from Green Frog. This is one of the 7 DVD’s in the set. They are housed in a sturdy plastic case. The discs are all labeled, unlike the factory picture. Ted Carlson was a Seattle native. Maynard Laing is the other photographer. Both men used 16mm color film. It is a clean looking collection of vintage steam footage. Green Frog is known for high production standards. Original sound recordings are the sources for the soundtrack. Emery Gulash is one of the audio contributors. Picture and sound are great. This is a varied compilation from the 2 cameramen. There is quite an assortment of classic railroading, both large and small. 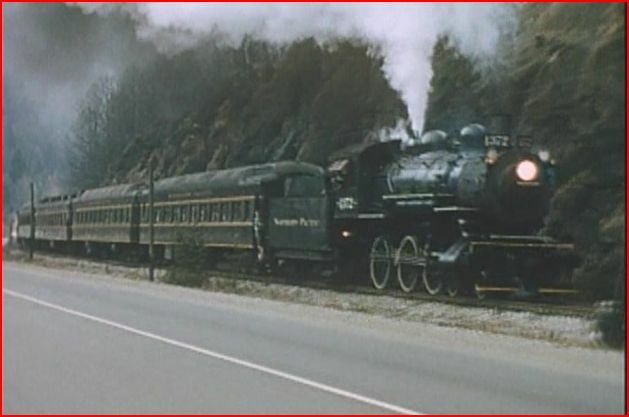 Northern Pacific is paced and pulls a Seattle- Snoqualamie Washington excursion. 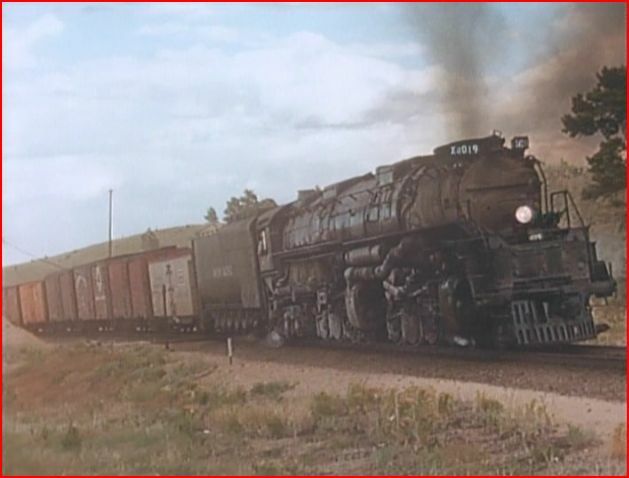 Union Pacific #8444. Never retired from active service. Impressive in any era! Big Boys and Challengers get some attention. The Big Boys are fantastic! Big Boys are paced from Ted Carlson’s 1955 Chevy! Cheyenne Tower and double headed Big Boys! 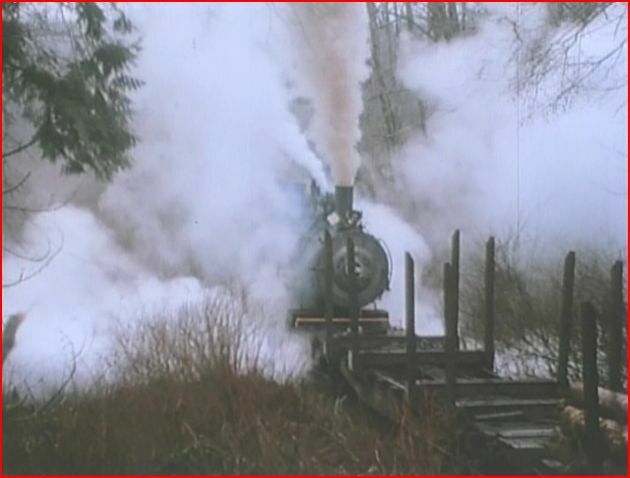 Ted Carlson had filmed some ‘must see’ pacing sequences on the UP main. Really, Ted has numerous pace sequences throughout the program. Narration by Don Chandler is smooth and professional. Stan Kyper has the script credit. A well-wriitten program. Plenty of space is left, to listen to the steam engines. This is an older show. No chapter menu or maps. The ‘next button’ on a remote can skip chapters. Logging lines are prominently featured. The various lines visited offer a nice mini-overview of logging operations. 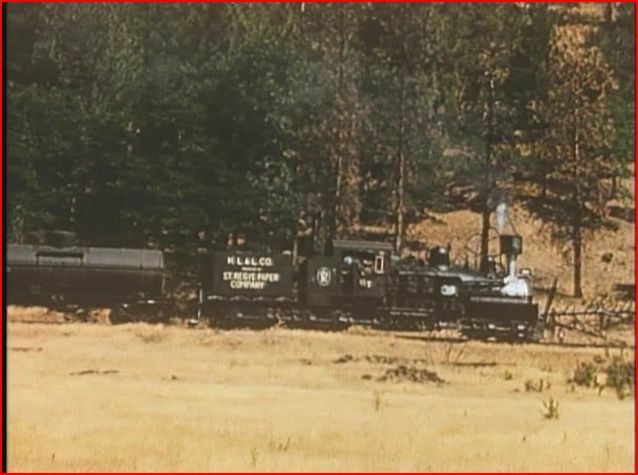 Different types of steam logging locomotives, work those forests. Shays, Articulateds, and Climaxes are shown. You may get hooked. Rayonier 120 is a 2-6-6-2 articulated. 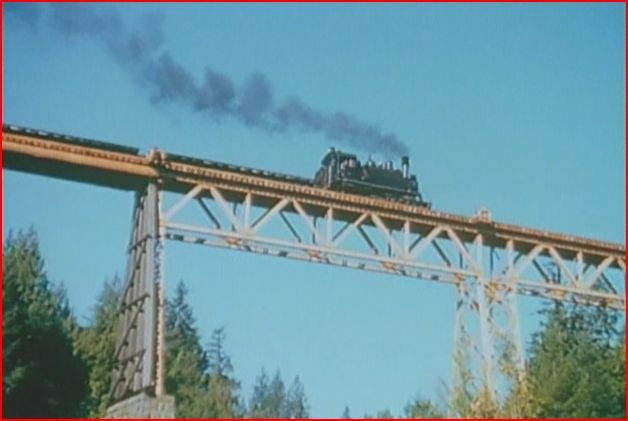 Note the train crossing a wooden trestle. Logging! 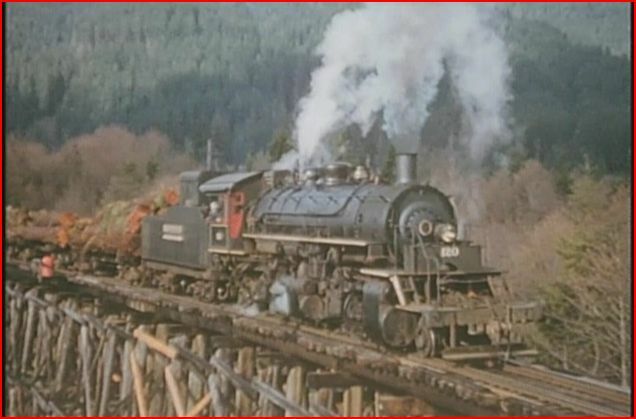 Canadian railroads are another fine chapter. Smaller lines are shown, along with some logging lines. Vancouver Island and Edmundton. 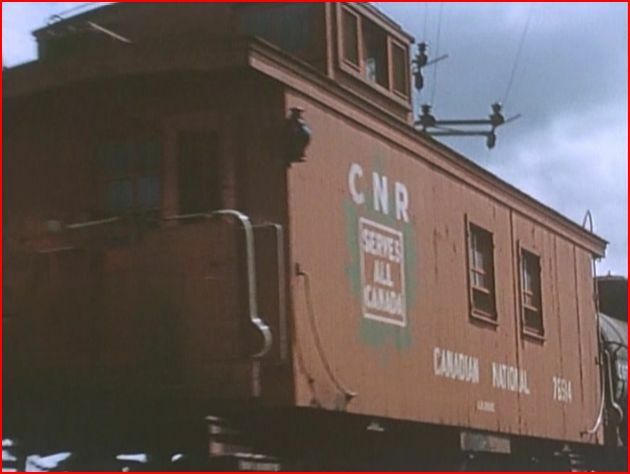 Northern Alberta Railway is not often seen, and a welcome sight. 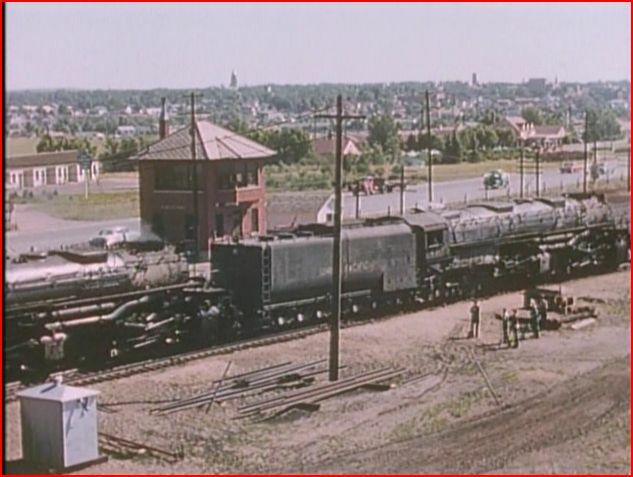 Of course, Canadian national and Canadian Pacific are here, with good scenes. 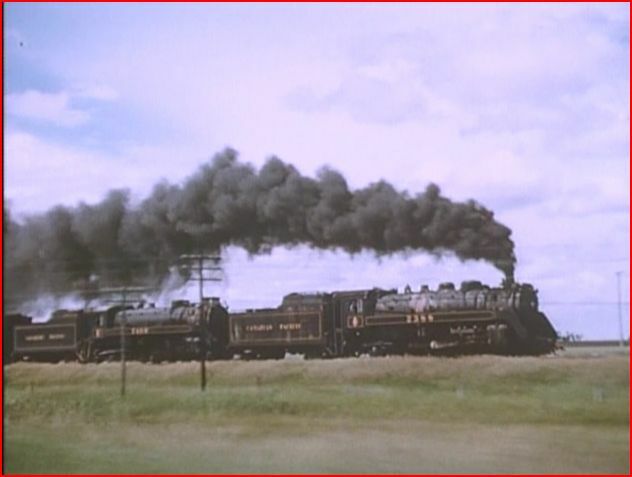 Double headed CP freight, is chased from the Trans Canada highway, in Alberta. Duluth Missabe and Iron Range. 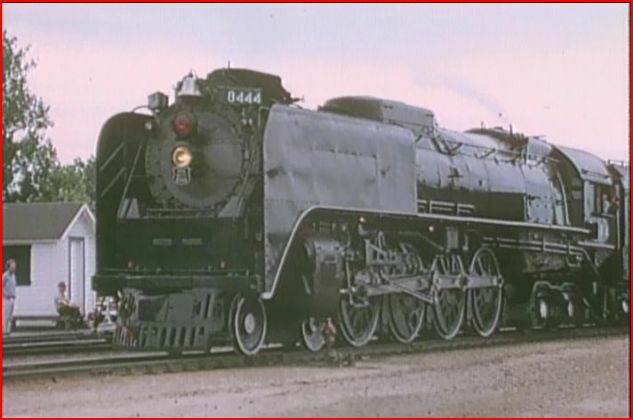 Massive Yellowstone class locomotives with a singular mission. To haul ore cars to be shipped on Lake Superior. Good pacing shots. 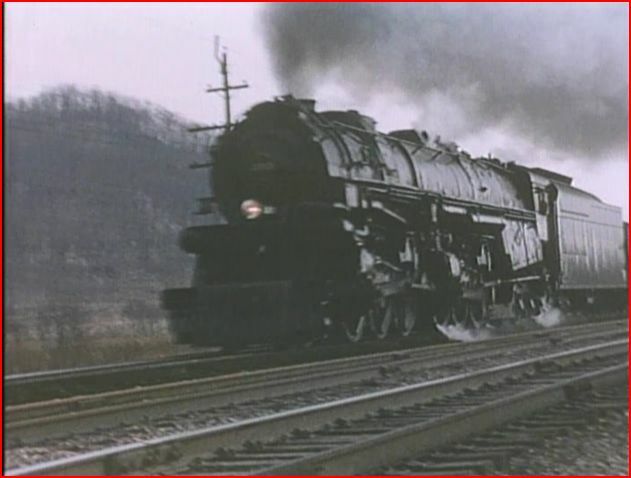 Norfolk and Western is the eastern railroad visited. Super steam power, in their twilight. The Y and J class are both included. The shot of the articulated, is paced from the car. Steam in the 50’s Volume 3. A very satisfying program. Action packed and enough variety to keep viewers coming back for more. 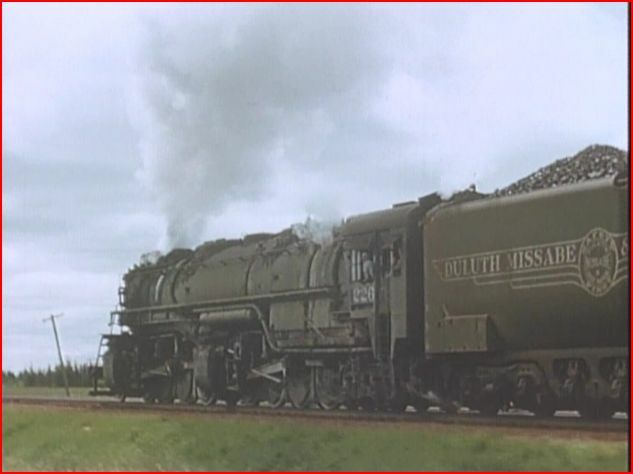 This entry was posted in ATVR Reviews, Green Frog Prod., Steam Train Reviews and tagged American Train Video Reviews, Logging, Norfolk & Western, steam train, Train DVD, Union Pacific by William J. Hudson. Bookmark the permalink.